The following is a guest review of a Costco wine compliments of the fine folks at The Fermented Fruit. On a recent trip to Costco in Arlington I was originally on the hunt for one of my new favorite Spanish bargains, the Tarima Hill Old Vine Monastrell, when I spotted the Hess Select Cabernet Sauvignon 2011. I had tasted prior vintages by the glass at several restaurants who pour this as their house Cabernet Sauvignon, but I had never actually committed to a full bottle. It’s not often you order house wine that actually tastes somewhat varietally correct and like…real wine. I decided at under $12 it was about time to pull the trigger and give it a shot. Nose: Sweet and moderately perfumed with dark red fruit, cedar and black olive. On the palate: Medium bodied with a soft and juicy core of red and black fruit. There are notes of anise, clove, raspberry, black cherry and currants enveloped by a nice spiciness. There are touches of leather and smokey vanilla on the dry, slightly tight finish. Should you buy? Consider making the Hess Select Cabernet Sauvignon 2011 your new house wine! Hess Select wines are crafted by Hess Winemakers from their own vineyards in Napa as well as from fruit sourced from partnerships with growers in Napa, Lake and Mendocino Counties. They are created with an emphasis on sustainable farming practices, value and are intended to be approachable and drinkable when young. 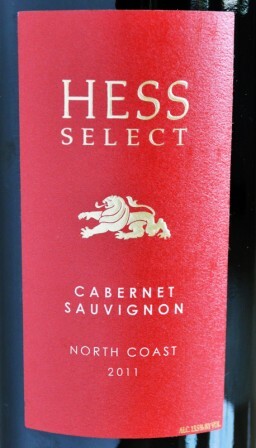 In my opinion, Hess has succeeded in doing just that with the Hess Select Cabernet Sauvignon 2011. It’s balanced with decent complexity and it actually tastes like Cabernet should. In a price category where competition can be overwhelming for consumers, this 2011 Cabernet Sauvignon makes a compelling argument for your consideration.